Looking for a durable, long lasting dog chew toy that cleans your dog’s teeth and your dog will find irresistible? Look no further! The Bristle Bone from Premier Pet Products Busy Buddy line of toys fits the bill. The Bristle Bone has FOUR different textures that will appeal to any dog. Durable nylon bristles provide a stiff cleaning surface, flexible rubber nubs appeal to the softer mouth, and tuff nylon ends can stand up to intense chewing, and the edible Gnawhide Rings are tasty and safe. Watch the video and see the Bristle Bone in action! This dental chew toy comes complete with two Gnawhide Rings and two extra refills. 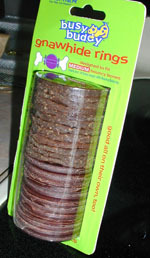 Additional Gnawhide ring refills are sold separately AND are interchangeable with the Bouncy Bone. The Bristle Bone comes in two sizes: Medium for dogs up to 50 pounds, and Large for the big guys. Watch the video to help decide which size is best for your dog. Don’t forget to add a couple of refill packages when you buy your dog a Bristle Bone! You can see demonstrations of all our chew toys by clicking on the name of the toy. See the Funny Bone, Kibble Nibble, and Tug-a-Jug and Bouncy Bone in action. WARNING: You Must have the latest version of FREE Flash Player Installed (Version 7 or Later) You can upgrade FREE by Clicking Here Now!